“The 1851 Chronicle” editors (left to right) Allison Nekola, Tristan Davis, and Rosemary Leger recieved a VIP tour of Spooky World Presents: Nightmare New England, in Litchfield, NH. Spooky World Presents: Nightmare New England, located in Litchfield, NH, may be the longest running and most dedicated haunted Halloween attraction New England has ever seen. It’s where drunken clowns, the living dead, and bloody mass-murderers rule the night. The original Spooky World opened in 1991 in Berlin, MA and each year relocated around the state. The attraction has finally settled next to Mel’s Funway Park. A sister company, Nightmare New England, was created in 2008 and eventually the two merged. The attraction targets adults and teens who love Halloween and aren’t afraid to run into a pitch-black building with only a glow stick as their guide (visitors experience this in The Manor, a haunted house fea- tured and also a fan favorite). A highlight this year is the Haunted Hayride, built on an additional 17 acres the company purchased next door. It’s part of the $1.5 million investment in haunt technology and all-new scenes of terror. The amusement themes are constantly being reimagined. “We always update this business, because things get old,” said Michael Krausert, co-owner of Spooky World. It’s become a tradition among families to take the annual trip to Spooky World, with the guarantee they will not fall victim to a monotonous platter of amusements. This year’s fun-filled adventure features The Festival of Fun, The Colony, The Manor, Carnage, and the Haunted Hayride. The stars of the haunted houses, the people who slather red goo from head to toe and wear masks revealing only half a face, are hired after auditioning for a spot as either a character in one of the houses or for what they call a “midway” actor. Landing the title of “midway” actor is major; they are the ones who get to interact with the guests while they’re waiting in line, or as early as when they walk into the park. The scariest of all the haunted houses was the Festival of Fear. The entrance opened with the face of a terrifying clown, and each visitor was given a pair of 3D glasses paired to enhance the expe- rience. Speakers blasted a mix of techno, similar to that of a club, but much creepier when surrounded by killer clowns. The whole house leaves the visitor dizzy and disoriented until the very end while provoking screams around every corner. 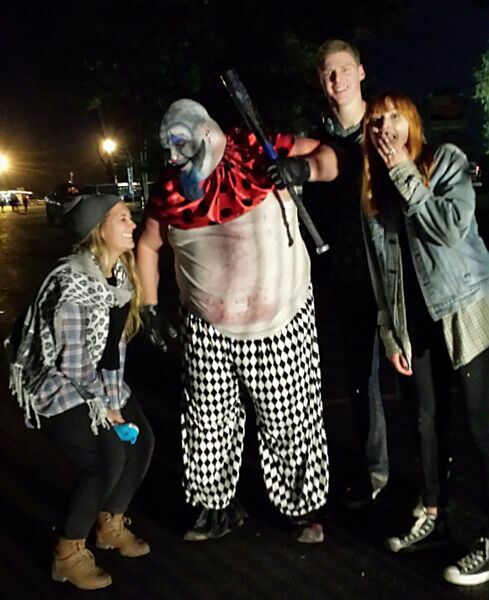 Not only are there haunted houses, but the attraction is filled with food, music, and carnival games. If students are interested in attend- ing a haunted house that feels all grown up, Spooky World Presents: Nightmare New England is open now until Novem- ber 7. Parking is $5 per car, general ad- mission costs $39.99, VIP $64.99, and Super VIP $79.99. It is open on Friday and Saturday from 6:00 p.m. to 11:00 p.m.